Diva is in watch mode – moving house has helped me uncover some hidden gems in my stash in form of watches so with renewed interest, I am now looking at dress watches. Paris Gallery launched the Guy Laroche 2013 Spring/Summer so I decided to see what they had to offer…. I like the one in the photo below out of the four that I saw but if you like dress watches, check them out. The fluidity of this new Swiss collection evolves from the luxurious, chic, and refined into efficient, accessible and trendy. This season’s designs are all about defining the brand especially for those who identify with the GUY LAROCHE image. Dignite: Elegance and simplicity are definitely part of the GUY LAROCHE image. This simple case design carries a European taste with its etched monogram GL Signature logo on the surface, and for the dial, three hands with a subdial for the seconds hand. 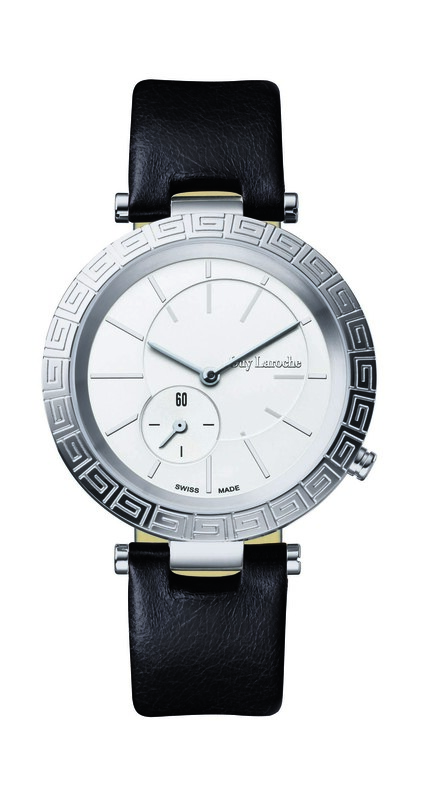 The genuine leather strap is available in Guy Laroche’s signature color — black and white – as well as in ochre. Elegance: Carousel is the inspiration for this new series. A pleasantly amazing watch, the design innovation is a big step for Guy Laroche in its creation; a stainless steel case with cubic zirconia and SWAROVSKI crystals placed together to create charming flower and leaf patterns on the surface. There is a matching rolling decoration piece that playfully moves around the watch 360˚ in the slightest shift of the wrist. The genuine leather straps also feature on its back, some soft colors as an added detail. Very elegantly-designed, this timepiece is sure to be the talking piece in any cocktail party.